Facebook's Events feature helps members to organize social gatherings and let friends know about upcoming events in their communities or online. Anyone can create an event on Facebook, and events can be invitation-only or open to anyone. You can invite friends, members of a group, or followers of a page. A Facebook Event spreads the word of an event quickly, potentially reaching many people in a short time. On the event page is an area for RSVPs, so you can get a handle on the number of people planning to attend. If the event is public and someone RSVPs that they are attending, that information shows up on that person’s newsfeed, where it can be seen by their friends. If the event is open to all, then the attendee’s friends can decide if they would like to attend, too. There's no need to worry that people will forget to attend: As the date of the event approaches, a reminder pops up on attendees’ home pages. You can make your Event open to the public or private. Only invited guests can see a private event page, although you may allow them to invite guests. If you create a Public Event, anyone on Facebook can see the event and search for it, even if they are not friends with you. Click the Events tab on the left side of your newsfeed on your Home page and click Create Event. Select Create Private Event from the drop-down menu. Click Choose a Theme from the recommended themes, which are categorized by occasion such as birthday, family, holiday, travel, and more. If you choose, upload a photo for the Event. Enter a name for the event in the field provided. If the Event has a physical location, enter it. If it is an online event, enter that information in the description box. Pick the date and time for the event. Add an ending time, if one applies. Type information about the event in the Description box. Click Create Private Event, which creates (and takes you to) the event's Facebook page. Click the Invite tab and enter the info for anyone you want to invite to the Event. Write a post, add a photo or video, or create a poll on this page to promote your Event. You set up a public event in the same way as a private event, up to a point. Select Create Public Event from the Create Event tab and enter a photo, event name, location, start and end day and time, just as you would for a private event. The Public Event setup screen has a section for additional information. You can choose an event category, enter keywords, and indicate whether the event offers free admission or is kid friendly. Click the Create button, which takes you to the event's new Facebook page. Facebook sets a 500-invite limit to avoid reports of spamming. 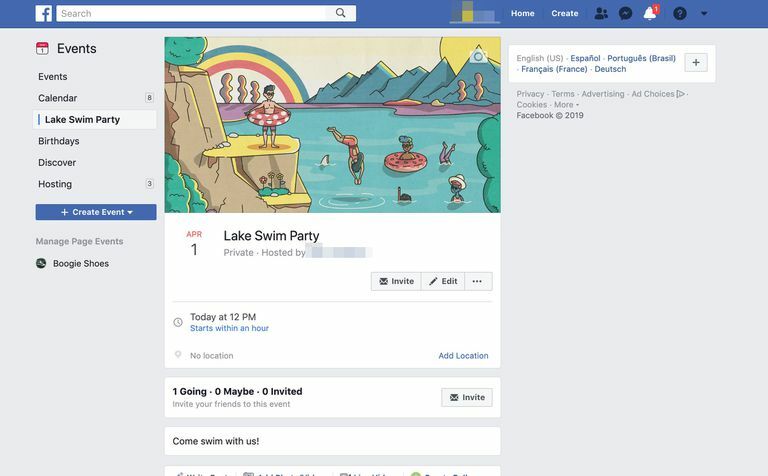 If you send invites to a large number of people who don't respond, Facebook reserves the right to further limit the number of people you can invite to your event. You can expand your reach by allowing anyone you invite to invite their friends and by naming a co-host, who is also allowed to invite up to 500 people. After you have your Event page scheduled and its page populated with interesting information, you'll want to promote the event to increase attendance. If your event is public, share the event on your newsfeed or in groups you belong to, if the group allows it. Create a Facebook ad for the event. Facebook ad rates are low, and you can target a specific audience. If you have a co-host for the event, ask that person to share the event also. As you approach the date of the event, share videos, stories, updates, and pictures on the Event page to generate interest. Use your mobile phone to go live from the event preparations or the event itself. Whether the event is private or public, you can invite all your Facebook friends or people you know from your groups or business page. If they aren't on Facebook, you can invite them by email or text address.